Bloom Lane, looking east from Crocker N.W. Here, take a look at Bloom Lane. You can see why all the property owners and residents would like the city government to keep its hands off their quiet little dead-end street in North Albany. They don’t want it widened or “improved” with curbs, gutters and sidewalks. They don’t want to be assessed for such work either. And you can’t blame them. But they might also want to think ahead a few years, when the pavement itself is likely to be falling apart if it’s not rebuilt with a proper base. And looking west, from the other end. 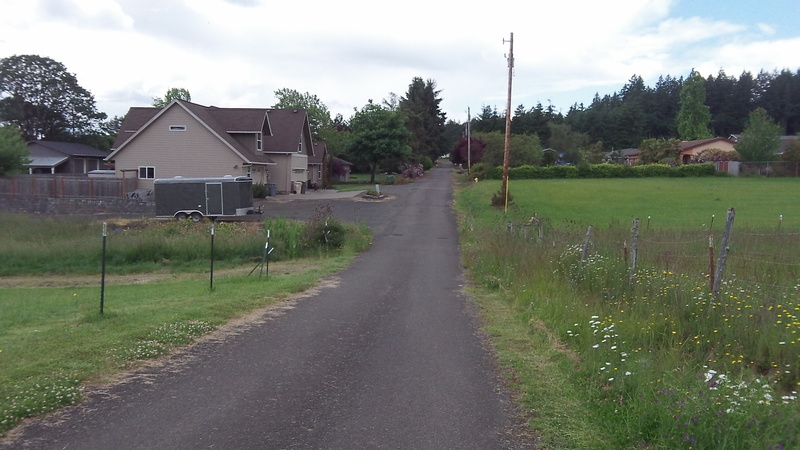 Bloom Lane is what the name implies, a country lane dating from before June 1991, when that part of North Albany was annexed by the city. But some of the houses on the lane have been built since, and some of the owners at the time signed waivers that they would not remonstrate against street improvements and assessments when the time came. 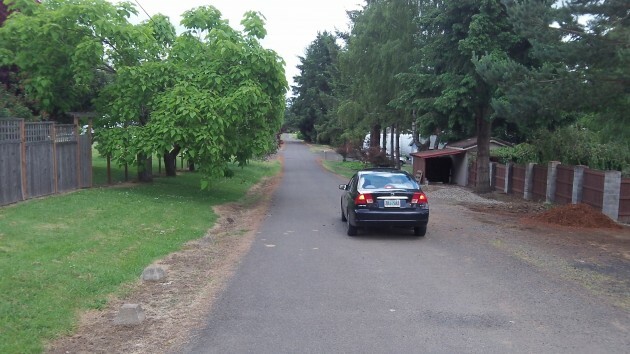 Because those waivers will expire in a year or two, the city council has now included Bloom Lane in a resolution, passed Wednesday night, to have city engineers determine the nature, extent and estimated costs of potential improvements along portions of nearby Crocker Lane and Valley View Drive. It is obvious that Bloom Lane needs no sidewalks, storm drains, gutters or sidewalks. It really is a pleasant little country lane, albeit with some newer houses and a few lots on which houses may yet be built. Council members seemed sympathetic. Owners along the lane have reason to hope that city engineers, preparing their report, will consider merely rebuilding the street surface itself instead of adding unnecessary embellishments. A sound surface with a strong base would prove helpful even if there is no rise in traffic. In time, the increasingly heavy trash and recycling trucks making their lumbering rounds every week will wear down the surface that is there. (Take it from someone who lives on a similar street, though outside the city limits.) And the cost of rebuilding it then — not having been built to any standards before — will be vastly higher than what it is now.